One of the best things about the internet is the fact that we now have access to independent boutiques across the globe without getting out of our pyjamas. Luisa via Roma has been getting a lot of attention of late, deservedly so, but most European cities seem to have that must-visit store, like Copenhagen's Paris Texas. The website for the boutique features brands like Preen, Rick Owens, and Surface to Air. 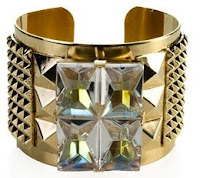 It was on a visit to this site that I discovered Marie Seguy and this gorgeous studded cuff.